The same God that was in control of my life the last 4 years is the same God that will be in control the next. Friends, we must keep our eyes on Jesus, our hearts purified by love and our hope in God through prayer. As believers in Jesus Christ, we are members of the Kingdom of God. 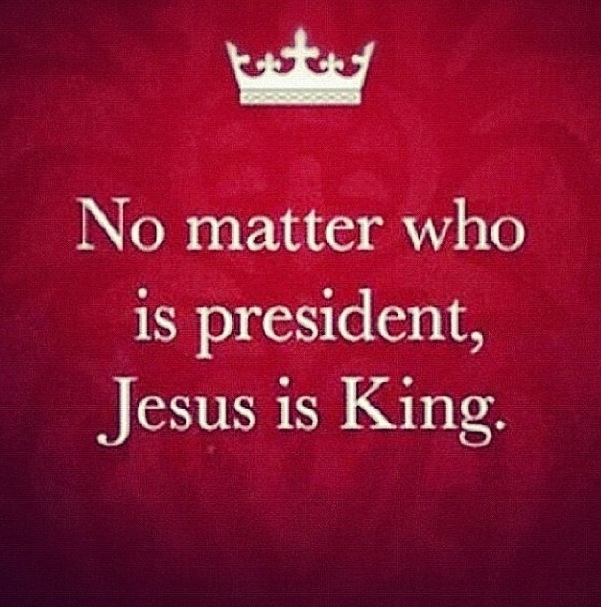 We serve the King of Kings and Lord of Lords. We are empowered by the Spirit. We are commanded to love. Last night, I had a powerful dream about the future of our nation and feel very strongly about the importance of prayer and love as we go into the next four years of presidential leadership. It's important to keep our hearts right, guard our words and walk in love no matter what. Remember: prayer, not politics, will bring the change we all desire to see in this nation. The same weight of responsibility we have to vote is the same weight of responsibility we have to pray. Please, pray for our president and nation as believers in Jesus. This is the way to true health and healing in our nation. Today, I'm thankful for my ability to vote, as many people fought for this right. But most importantly, I'm thankful that God is in control. He is the leader of my heart. He is the captain to my ship. He is the source of my freedom and my hope is fully in His ability to shift the heart of our president and our nation towards Him. As we head to bed tonight, let's rest in peace, remain united in prayer and hopeful in our God's lordship over all. So, what are you thankful for tonight? Do you trust that God is in control? Are you committed to walking in love, praying for our president and elected officials and keeping your heart pure?